Here it is. The long-anticipated name of the newest version of Android was finally revealed today as Android Nougat. My first thought was - relief! We finally have a name and can stop calling it the tauntingly incomplete Android N. "N" was a reminder that this Android was still somewhat of a mystery, a codename just waiting for a candy-coated moniker. Its name was in beta, just like the new operating system itself. My second to sixth thoughts were more varied, and led to many questions about where Android's naming convention goes from here. I've jotted them down below. It's chewy, it can be hard and it's usually tooth-achingly sweet. Yes, some nougat is creamy and delicious, like what you'd find in a Snickers bar, but Google has chosen to attach Android N to my least favorite nougat (see above photo). It's the kind that sticks to your chicklets and feels like it's literally giving you cavities as you (try to) eat it. I know this is not an insightful observation, but the fact that I already hate nougat gives me weird feelings about a mobile operating system named after it. It doesn't exactly bode well for our future together. 2. Is Android Nougat really what the people wanted? 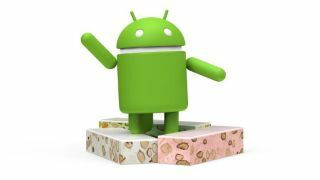 Google asked the general populace to help it name this version of Android, but is Nougat really what we voted for? I had my doubts, though, according to Google, Android Nougat was one of the most popular non-branded suggested names among millions of submissions (emphasis Google's). A company spokesperson noted that from the get-go the Android team said it would make the final naming decision. Personally, I would have preferred Android Nacho, though that's problematic on several levels, not least because nachos are not a sweet confection. Android Nutella is a strong second for me, though without a brand tie-in, like Android KitKat had, I'm also not surprised it didn't make the cut, either. After that, Android Nectarine had my vote, though Google is probably saving citrus for later. I suppose, then, Nougat, is a natural choice, though it doesn't feel particularly inspired. It's almost so predictable, it's boring. And chewy - let's not forget that. 3. Now that we have a name, are new Nexus phones next? Android N is already in beta, and now that it has a name, even more questions are starting to surface. The big date on the horizon is "late summer" as that's when Android Nougat is releasing to the wild, Google says, but that doesn't mean consumers will actually see Android 7 at that time. New versions of Android are notoriously slow to reach users because carriers hold the keys to the OS floodgates. But, we're talking about a whole new version of Android here - might Google release a new Nexus to mark its arrival? While a new, reasonably priced device might make sense before school gets into session, the timing would be odd for Google to announce a Nexus, according to our Senior Mobile Editor Matt Swider. He speculates that Google will in fact wait until Android Nougat 7.1 to release a new Nexus, along with Daydream VR support. I'm inclined to agree, first because of the timing - a new Nexus release makes more sense around the holidays - and second because it seems like Google would want to put out a Daydream-ready device to get the ball rolling on its VR venture as well as pump up the new OS. Introducing a VR-compatible Nexus phone that's running the latest version of Android makes the most sense to me, and doesn't seem likely to happen until later this year. 4. What happens when we get to Android Z? We still have 12 letters to go but the chatter among TechRadar staff is: what happens when we get to Android Z? Zeitgeist? Zebra? Zero Bars are a thing, according to the internet. Now that I type this out - what about Android X? I feel a crisis coming on. All this is to say, how sustainable is Google's Android naming scheme now that we're getting into the more difficult, less popular letters of the alphabet? It's a similar question asked of the iPhone: iPhone 7, 8 and 9 aren't too crazy, but are we really going to have an iPhone 10? It's highly doubtful. Google still has plenty of time before it runs into Android U, but it may want to start thinking of an exit strategy now. There are still a lot of questions surrounding Android Nougat, and while it won't reach market saturation for quite some time, it's not too early to start thinking about Android O. Chances are we'll hear plenty about O at Google IO 2017, which will be here in less than year. What features will Google introduce in the next version of Android? One prediction is improved chat integration, including incorporating its new Allo app into the mix without overwhelming consumers with conversational client choice. But, as you may have guessed, I'm also heavily invested in its name. What delicious treat will Android O be named after? Oreo? Orbit? Oh Henry!? Orville Redenbacher? Or, might Google take a healthy (non-branded) turn - Android Orange, anyone?